News just dropped through from Wilocity about its new Wil6300 chipset announced at Mobile World Congress. The Wil6300 chipset is quoted as the world’s first 802.11ad ‘WiGig’ multi-gigabit WiFi chipset for smartphones. Wilocity are stating a peak speed of 4.6 Gbps over an 802.11ad network, equivalent to 8-antenna based WiFi. So while 802.11ad can have limited range (10m with no walls) due to the 60 GHz frequency band used, there is scope in home and work user environments for faster in-network data streaming, such as video. 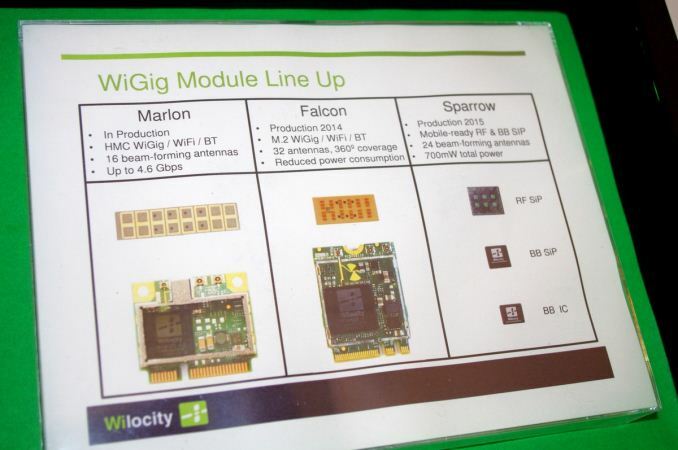 Wilocity has a history of WiGig development – we covered their desktop PC 802.11ad development back at Computex 2012 and sales figures for Wilocity number more than a million since February 2013. In the mobile space, this new chipset is built on a 28nm process and power use is expected in the 200-300mW range in use. While idle, power consumption is rated at sub 1mW, and the 700mW total power quoted above is for pure file transfer. Wilocity’s development cycle puts mobile based 802.11ad in the 2015 space. They are working with ‘the usual players’ in the market. The module we were shown implemented 802.11n and 802.11ad in the same device, and I was quoted that with economies of scale the price of the 802.11ad module could be brought down to that of 802.11ac. Wilocity is also using beamforming to help improve quality at extended ranges, with up to 50 meters being tested and confirmed, albeit at lower speeds. The main issue is walls, which they are working on. 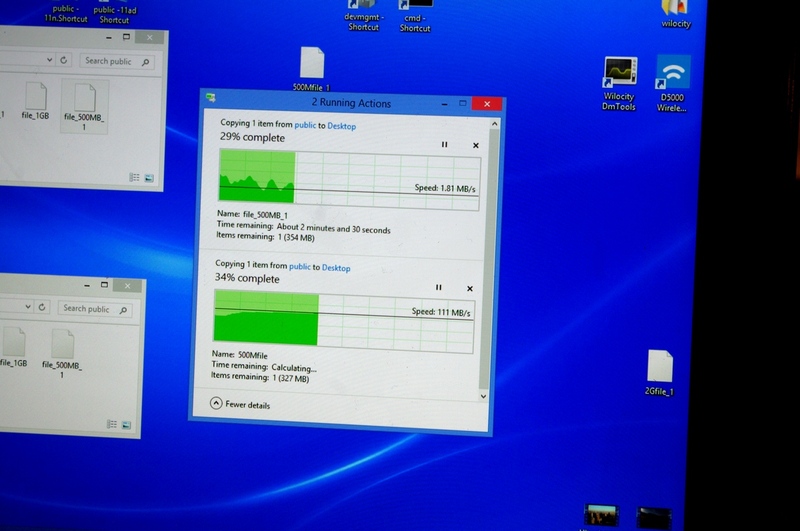 What's the point of 802.11ad anymore when 802.11ac-2013 will give you 7 Gbps on the 5Ghz band? Personally, I'd like the Wi-Fi Alliance to focus on making a Wi-Fi standard that given enough deployment can disrupt carriers and ISPs through meshnets either from people themselves or deployed by companies like Google or whoever wants to pick up such a project. 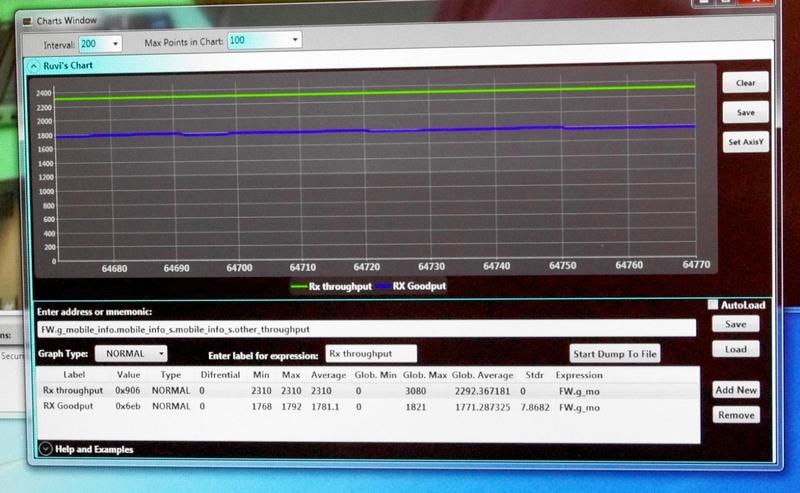 But to do that we need LONGER-range Wi-Fi, not shorter, like 802.11ac and even shorter with 802.11ad. I know conflict between nodes is a problem currently, perhaps some pCell-like technology can be used to create "wi-fi bubbles". The 7Gbps number requires use of a huge chunk of the total 5ghz spectrum; unless you're in a cabin in the woods, you're not going to have that much spectrum free. 60ghz's inability to penetrate walls means that you never need to worry about your neighbors network interfering with yours. It's a great option for things like wireless docking stations, for streaming video from your phone to your TV, or for wireless home theater in general. I suppose 802.11ad could be useful as sort of a super powerful NFC that could connect devices in very short ranges, like say an Oculus Rift type of device with a smartphone. But 4.6 Gbps isn't going to cut it, as I think OR already uses more bandwidth than that, and it's going to surpass 20 Gbps once it moves to 4k. It could still work for stuff like locally streaming media, though. As for the longer range Wi-Fi, as I said I realize it's a problem with the interference. But it seems a pCell like technology could solve that, and not just eliminate the interference problem, but actually use the several radio waves hitting each other to boost your signal and bandwidth. If they could do that for say 802.11ae, along with getting access to some sub-2Ghz unlicensed spectrum for 1+ Km ranges, that would be pretty amazing. The power thing shouldn't be that big of an issue for home routers, though, only for the Wi-Fi in mobiles. Maybe in the future we can just use software/CPU-based Wi-Fi that can take advantage of Moore's Law, and rapidly become more efficient/more powerful to boost ranges with low power consumption. There is no Moore's law for radios. You are already radiating a significant portion of the input energy as radio power. You aren't going to gain much in the way of efficiencies there. You might in the signal processors, but even there, you are highly limited. Unless someone develops new algorithms there is a limit in signal to noise ratio before the signal is just swamped in the noise. You two choices then are increase transmit power, which costs power, or else increase antenna size/gain, which isn't feasible on a mobile device (or at least not really) and ends up costing a lot on the base station. A 14dB omni antenna is perfectly feasible, but get much bigger than that and the half power beamwidth is going to be so narrow that you are going to have serious issues with any kind of elevation change compared to the antenna. So you get in to directional antennas, which again, if you want a bunch of signal gain, means resorting to a LOT of directional antennas to blanket a 360* area. So what you really want is a signal that propogates through obstructions a lot better. Enter white space Wifi. At best you might see something like half a mile coverage using a big 14dB omni antenna is a relatively rural area with some modest foliage in the way (IE, not a forest, but some trees, a few houses, no hills in the way, etc). Half that in a semi-dense suburban situation or forested area. Probably a city block in a real city, or you might cover most of a large city part with one. Of course in those urban scenarios you are getting hosed by having lots of people connecting to a single base station. In an urban environment you are much better off dealing with relatively low power base stations and LOTS of them with seamless hand-offs. Something like a low power 5.8GHz base station on every light pole either running fiber between, back to nodes, or maybe even using directional 5.8GHz on a different channel or 2.4GHz directional aimed at a wireless aggregating node(s) to connect to a physical backhaul. The suburban/rural situation is maybe high power 2.4GHz with big ole antennas in the suburban scenario and white space in the rural or maybe white space with small caps on per user speeds in the suburban scenario along with some high power 2.4GHz base stations mixed in, again with seamless hand-offs between stations and frequencies. 700-800MHz for white space wifi penetrates very well and doesn't take a huge antenna, and has resonable bandwidth, especially in a lot of rural areas. You could easily deploy a single base station to cover something like a mile radius or more and then use a highly direction 2.4GHz backhaul between basestations back to a node. Another option that I still haven't head scratched my way around is 900MHz. Its ISM/unlicensed territory. I know it is used by a lot of things (baby monitors, wireless phones (not the cell kind)), but I still don't see why no one is seriously looking at it for Wifi. Maybe the transmit power is too limited on it, but I can still remember my kid's baby monitor working across my house, down the steps, out the front door and most of the way to the neighbors down my row of townhouses probably 150ft, in interior floor, 2 interior walls and exterior aluminum sided wall away. My 2.4GHz router I could barely pick up 10 steps out my front door and it was on the same level as my entryway and 2 interior walls less interferance. So it seems to me, 900MHz could be a pretty good choice, even if you are limited in spectrum within you could use. Everyone is all about faster and faster, but longer and longer would be nice too. Even 4 5MHz channels and using a single channel at a time could be nice. with 11n, that is something like 14-18Mbps per 5MHz and switching to 11ac with the higher 256QAM coding its more like 25-28Mbps per 5MHz channel, per radio of course. So with a 2:2 MIMO setup and 256QAM encoding, I'd think with good signal strength you'd be able to play with around 11b type speeds of around 54Mbps. It isn't amaze fast, but it is much longer internets. I am still confused about the commercialized WiGig products in the market.